We are big fans of Zattoo – the superb TV-on-computer service that isn't just Windows-only! Zattoo lets you stream Freeview channels online absolutely free. Even better, it has just notably upgraded its picture quality. Just in time for Christmas! As Zattoo's press announcement reminds us: "Pine needles scattered finely about the tree. Dogs caught up in the fairy lights. The chorus of "thanks, mum, just what I wanted!" Slightly dry turkey with lashings of gravy and cranberry sauce. Grandpa snoring in the corner. And the Queen's Speech. "That's the traditional British Christmas we've all grown to love. This year you can make the most of it with Zattoo. We're offering all of you, just for the holiday period, broadcast quality TV on your computer." Zattoo's announcement adds: "Our five most popular channels, as watched by you, will be on full screen quality totally free from 15 Dec to 14 Jan. That's BBC1, BBC2, ITV1, Channel 4 and BBC News." Ideal, as it means you need no longer be tied to Oliver! and The Sound of Music (for the nineteenth Xmas in a row) over at the in-laws. 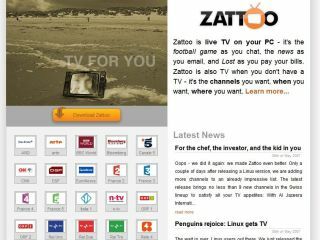 The Zattoo client is available for XP, Vista, OS X and Linux, and offers 30 UK channels and a selection of stations from Europe, The Poker Channel and Al Jazeera. Content is live, and what with the new and improved picture quality it really is worth a download when you have a spare minute or two.